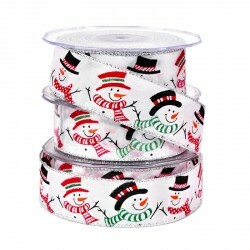 Our Christmas ribbon selection includes satin ribbon, organza ribbon, metallic ribbons and Christmas design ribbons. 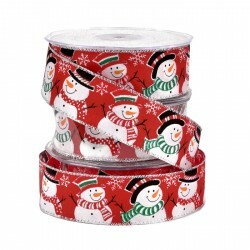 Christmas ribbon is available to purchase throughout the year, however new designs and styles will be added from September onwards, some designs will not be continued. 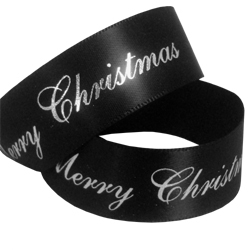 For more information and prices on this years ribons please click on the ribbon catergories below. Christmas Jute Ribbon Sold per roll 15 metres per roll 2 width sizes 10mm and.. 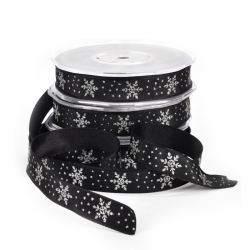 Crystal Snowflake Ribbon Sold per roll 15mm x 15m Black wire edged Crystal ..
Snowman Christmas Ribbon 40mm x 15m rolls Wired edge Christmas ribbon Glitter eff..
Snowman Ribbon 40mm x 15m rolls Wired edge Christmas ribbon Glitter effect ..